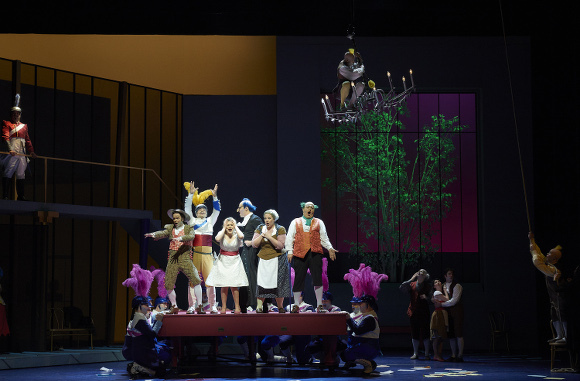 The COC’s new production of Rossini’s The Barber of Seville opened last night at the Four Season’s Centre. 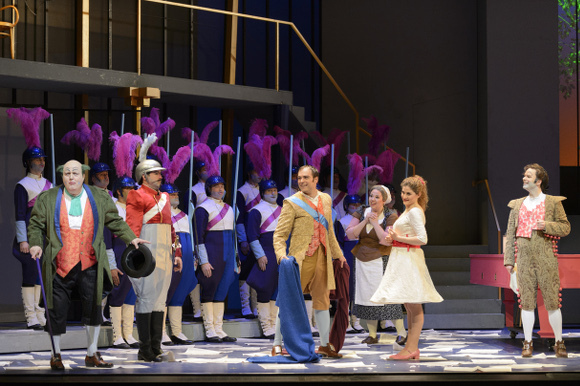 The production is by the Catalan collective Els Comediants, the same team who did La Cenerentola a few seasons back, with direction by Joan Font and designs by Joan Guillén. It’s a riot in a good way. It’s bold, colourful and very well choreographed. 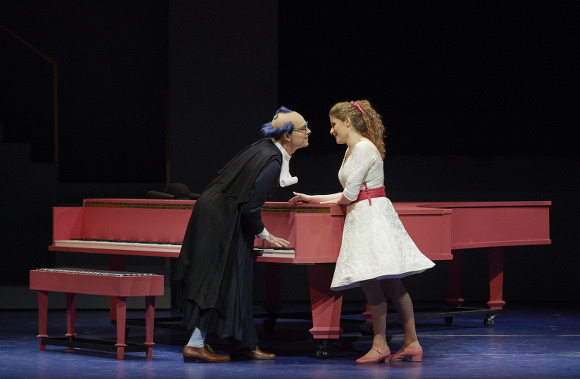 There are giant props; for example a huge guitar from which Almaviva sings his serenade and a giant pink piano which serves for all kinds of shenanigans. A lot of the “sung action” is doubled by actors in a sort of on stage projection cube. Scene changes are “on the fly” and the curtain only comes down for the interval and the end. Bold, clever, slick. The cast is a perfect example of what the COC does well; assemble a mix of the reasonably well known, the locally familiar and some who are not so well known in North America but have solid European reputations. The headliner, I suppose, is Joshua Hopkins in the title role. He’s young but has a solid resume and last night showed why. He’s vocally rock solid, athletic and very funny; all qualities needed in this production. He was well matched by the Rosina of Serena Malfi. Sultry of voice and body she has a lovely smoky tone and made the most of both her big arias. 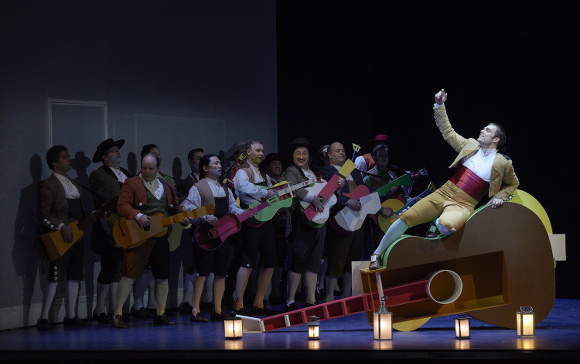 I guess in a wild production one test of quality is that pieces like the Largo al factotum and Una voce poco fa remain memorable and here they did. Her acting is a bit special too. Her body language is fascinating in places. Alek Schrader sang Almaviva. Once again great acting and solid singing with, perhaps, just a slight nasality in the very upper register. Then we got two bass bonuses. Robert Gleadow, who seems to be in everything at the COC (and I have no problem with that) was a brilliant Don Basilio. 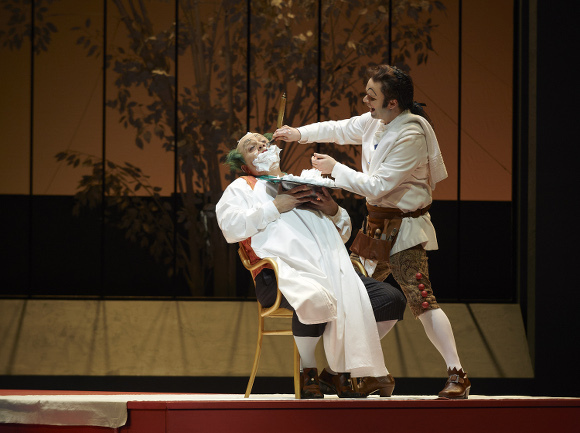 I’ve seen him do slapstick before but here he took it to a new level with JdF style cavorting and the worst haircut of all on a night of spectacularly bad haircuts (not a great advert for Figaro’s barbering skills). And the voice; rich, powerful, filling the house as soon as he opened his mouth. Then, for me, the discovery of the night; Renato Girolami as Bartolo. It’s clear why he is seen in many of the best houses in Europe. he’s the classic Italian basso buffo. He has a good voice, great comic timing and can pull out all the vocal tricks. I loved his alto castrato impersonation. The cast is rounded out by three Ensemble Studio members; Iain MacNeil as Fiorello, Clarence Frazer as The Officer and Aviva Fortunata as Berta. The last has a real aria and she made the most of it. The men of the COC chorus were their usual solid selves and the orchestra were excellent. This is not, I suppose, really a conductor’s opera and I guess I really didn’t notice Rory Macdonald’s conducting. That’s a compliment but I will try to focus more on that when I see the show again. OK, so it’s not the most profound thing that you will ever see in an opera house but it’s terrific fun and makes for a very enjoyable evening. And it was a COC opening with no boos. Really, go see it and take a friend or three. I can’t imagine anyone from jaded opera sophisticate to newbie not having fun with this one. The main roles here are double cast with the B team taking over for most of the May performances (details vary so check the COC website). There are eleven more shows between now and 22nd May with the annual Ensemble Studio performance as a bonus on May 15th. The first chance to see the full second cast is May 9th which is when I will be back. This entry was posted in Performance review - COC and tagged coc, els comediants, font, fortunata, frazer, girolami, gleadow, guillen, hopkins, macdonald, macneil, malfi, rossini, shrader by operaramblings. Bookmark the permalink.